So, how easy is it to service my Aga? REALLY EASY! GO ON! Read the Customer Comments - they say more than we ever can. "I wish I'd started this years ago" is our most frequent comment. And if you are still unsure, phone us on +44 (0) 1963 31858. And you will save so much money! Apart from saving £90 every time an engineer visits, you can save about 15% of your fuel costs by running your Aga more fuel-efficiently. With the price of oil remaining very high, it makes sense to be able to act independently and be totally in control of your cooker. We have found that once our customers have serviced their Aga once, they get more and more confident - and inquisitive. Please note: Our Aga service instructions only apply to oil-fired Agas, they will not work with a gas-fired Aga. We give you thorough step-by-step instructions with clear photographs to show you how to service your own Aga. This photo shows the burner door. Getting close up and personal with the pipework. Aga cookers are easy to service yourself once you are familiar with the basic components. How do I get Access to the Instructions? Access follows payment to Paypal via the site, and then you will immediately and automatically be sent a password. This gives you access to the full website and you can save the pages of information, print them off and/or, return to the site at will. Also, as we update the site and add extra features, you  at the moment  continue to have access to that too. For example the technical FAQs are extensive, and are expanded regularly. When will I receive the wicks? They are sent out within 24 hours, by post. There is plenty of rubbish spoken about wicks. The wick is used to get the aga started, after which it plays a role at the correct operating temperature, by ensuring the rapid vaporising of the oil. And we now include a free 3mm drill bit in the same envelope to ensure that you can get right through the carbon, ready to scrape the edges back to bare metal. Can I get further help if I have a problem after using your instructions? Certainly! Email us and we will try to respond the same day. Some of our customers have entered into lengthy electronic dialogues! But, be reasonable. Can you phone up or email your service engineer and expect an enduring personal service for free? Unlikely! Neither can we work miracles, so be reasonable about what you expect, though we really try to help. Do you send me a manual? No. All the instructions are on the web site which you access using the password we give to you. And the FAQs provide lots of extra information. Indeed, more so than the instructions themselves. Do you advise on other aspects of maintenance, including the flue and oil control valve? The FAQs help you out. But we have restricted ourselves to advice for an oil fired aga, though the instructions are common to most models. 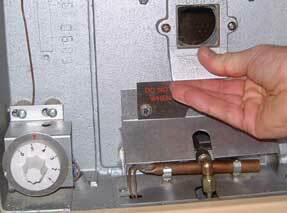 We do not recommend that you change the settings of the control valve/regulator. You can test the thermostat, replace the 240 to 12v transformer, replace the bimetallic heater (resistor), check oil flow rates etc, but you have to be confident before you play with the adjusters on the control valve/regulator. The reason for this is that they are initially set up to allow certain oil flow rates, and also because the time lag taken by the aga to reflect an adjustment, this makes the setting process (in situ) frustratingly slow. Nevertheless, the site does offer an explanation of the system to allow the more adventurous (or desperate) to make progress. 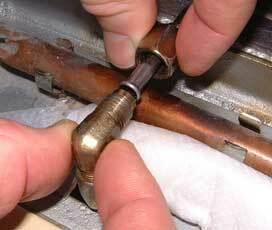 Remember that altering the flow rates is a final resort but, should you ask, we will advise you if it is necessary. Will my aga will be properly serviced if I follow your instructions? Yes, but remember that you may have other problems that will have to be dealt with as well. eg. a contaminated oil supply, or blocked filters, as an example. If your Aga is working fine before you turn it off, there is NO REASON WHY OUR STRAIGHT FORWARD INSTRUCTIONS will not set you up for the next re-light. We can advise you on how to undertake most repairs, and can supply you with all the spares you might need. We now stock a huge range of parts at very reasonable prices. Advice can be sought on how to fit everything. May I pay by cheque or over the telepone? Ring the office with your card details if you prefer not to use the web payment system. And finally, what does aga stand for? Gustav Dalen was a blind Nobel prize-winning Swedish gas scientist, who developed the prototype aga in his spare time. He launched it in 1929, naming it after the initials of his company  Aktiebolaget Gas Accumulator.